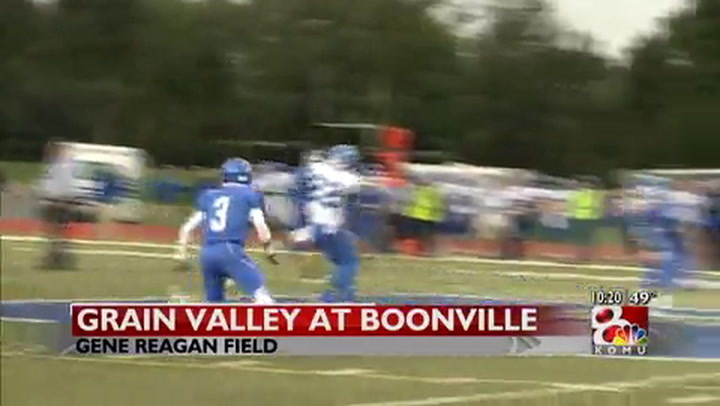 Boonville is coming off an average 4-6 campaign on which they would like to improve on in 2014. Times have been pretty good for the Pirates since Head Coach Devin Brown rolled into town. In his four seasons at the school, Boonville has a record of 20 wins against 13 losses. They hope to get back on the winning track this season. "Last season was an up and down rollercoaster for our team," Coach Brown said. "We had some big wins and some bad losses. We started off 0-3 against ranked teams in Class 2, 3, and 4, then had a big win against Knob Noster. We beat rival Mexico at their place and beat Fulton on the last play of the game on a hail mary pass." This season, The Pirates return just four starters on the offensive ball. At the most important position in team sports, quarterback, Boonville will start sophomore Nick Zeitlow (6-4, 170). He certainly has the tools to succeed in the NCM Conference. "Nick has a good arm and instincts," Coach Brown said. "He just needs experience." It certainly looks like he will get some experience in 2014. Don't be surprised if he's one of the better quarterbacks in the area by the time he's a senior. Nick Zeitlow's favorite target figures to be senior wide receiver Austin Hulbert (5-10, 165), who Coach Brown is counting on to be a leader on and off the field. Last season, Hulbert caught 44 passes for 641 yards and five touchdowns. Josh Judd (5-10, 170), also a senior, will start at wide receiver, too. He caught 26 balls for 298 yards and a score last season. Two other seniors, Mark Pitts (5-9, 175) and Alec Vertel (6-1, 180), will vie for time at wide receiver. Coach Brown said Pitts has great speed and athleticism, while Vertel has great hands. They both want to make an impact in their last season of high school football. The Pirates running attack will be led by returning junior Jordan Weaver (5-9, 175). Weaver saw some playing time in 2013, carrying the ball 26 times for 298 yards and a touchdown. Another junior, J.T. Washington (6-0, 200), will also see plenty of carries out of the backfield. Coach Brown said J.T. is a "powerful running back getting his first varsity experience." Up front, the offensive line will be anchored by junior Tyler Polk (5-11, 220), who started as a sophomore last season. Coach Brown has to be thrilled he will be around for two more years. Another junior, Azis Simon (6-1, 295), will also start on the line. Coach Brown said he has good power and feet. The Pirates offense averaged just 16 points per game last season, a number they surely want to increase. They'll run multiple offensive formations. "We will have a very young offense this year so we want to be able to use our speed to our advantage and we want to get better every week," Coach Brown said. Like many high school squads, Boonville has quite a few two-way players. The linebacking corps will be led by Jordan Weaver and senior Austin Henderson (5-10, 170). Henderson played in just six games last season, but had 45 total tackles and a sack. Weaver had 90 total tackles and a sack of his own. Both of these linebackers are sideline to sideline players who can get after the quarterback when asked. Up front, the defensive line will be anchored by Tyler Polk, who had 30 total tackles, two of which were for a loss. Azis Simon will also start on the defensive line in addition to his responsibilities on offense. They hope to tally a few more sacks this season and stuff the running game. The Pirates do have an experienced secondary, with cornerbacks Austin Hulbert and Josh Judd back for their senior seasons. Hulbert had an impressive 69 total tackles last year, while Judd had 20, to go along with two interceptions. "We have a very young defense and will need to improve every week as the seasons go on," Coach Brown said. He also explained how his team will need to play hard in the games and on the practice field. "With a young team and so few seniors, we will have to work hard every day in practice in order to get better each week," he said. Look for this young group to develop into a solid team over the next couple years.